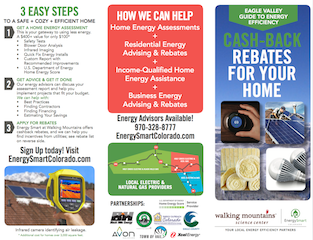 Energy Smart Colorado is a program that assists residents and business owners in Pitkin, Garfield, Gunnison, Summit, Eagle, and Lake Counties in improving the comfort, safety and efficiency of their homes and/or businesses. Colorado’s Affordable Residential Energy program (CARE) is committed to increasing comfort, creating a safer living environment, and lowering energy bills for income-qualified Coloradans. CARE leverages EOC funding, utility rebates, and local resources to provide FREE energy efficiency services to income qualified participants like appliance upgrades and air sealing which help reduce energy bills. CLICK HERE to find out if you qualify. | CLICK HERE to fill out the application. Want to save money, stay comfortable in the winter, and make the environmentally responsible choice? 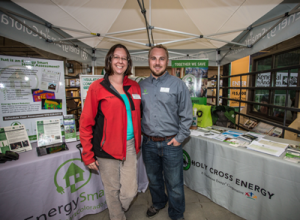 Let the Energy Smart Colorado team at Walking Mountains Science Center help you become more energy efficient! The Energy Smart program in Eagle County is funded in part by Eagle County Eco-Build funds which are fees for energy building code mitigation collected in unincorporated Eagle County. Since its inception, over $1.2 million in community grants, solar rebates, and energy efficiency rebates have been distributed into our community. We also work in partnership with and are generously supported by Holy Cross Energy. > Click here or our rebate brochure below to learn more! 50% of project cost up to $1,000. (not to exceed 50% of project cost when combined with utility rebates). Additionally, we offer 50% up to $1,000 for an energy assessment for your business (ASHRAE Level II or Higher). Thinking about an Electric Vehicle? Click here to learn more about electric vehicles, tax incentives and where you can charge them in Eagle County.